This garden gate was made to commission. 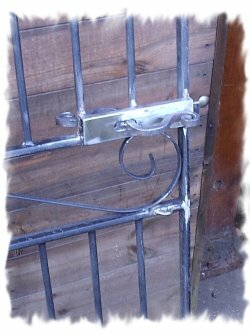 It is made from mild steel and has a sliding bolt with a padlock securing point. The gate also has a matching fill, the small piece of iron work that supports the gate and hangs it from the wall. The gate was supplied with lock nut hinges so it cannot be removed from the hinges. It has a satin paint finish. The commission fee also included a site visit at the design stage, a presentation drawing and installation.